As cat owners we do everything that we can for our pets. Read on to find out how Feliway® and Catego™ can help to keep your cats happy and healthy. Our cat 18 year-old cat Angel had the house all to herself for years until we brought home the newest member of our family, Xena. We thought Angel might enjoy having a friend to play with and keep her company. We envisioned Angel and little Xena napping together, grooming each other, and playing happily together. But Angel wasn't having it. We tried our best to ease Xena into the house as gradually as possible. We kept her in basement for the first week or so, while encouraging Angel to sniff around the basement door to pick up some of her new friend's scent. Then, we brought Angel into the basement to introduce her to Xena. Angel wanted nothing to do with Xena and would dart right back upstairs. We tried short 2-4 minute sessions of bringing Angel into the basement and closing the door so she couldn't run upstairs. This would result in Angel sitting next to the door hissing, growling, with her ears back and ready to attack at any moment. While we have only had our Feliway® MultiCat Diffuser plugged in for a little over a week, and optimal results can be seen after 30 days, I am happy to report that the results thus far have been promising! Angel seems to be tolerating Xena sitting near her better than before. 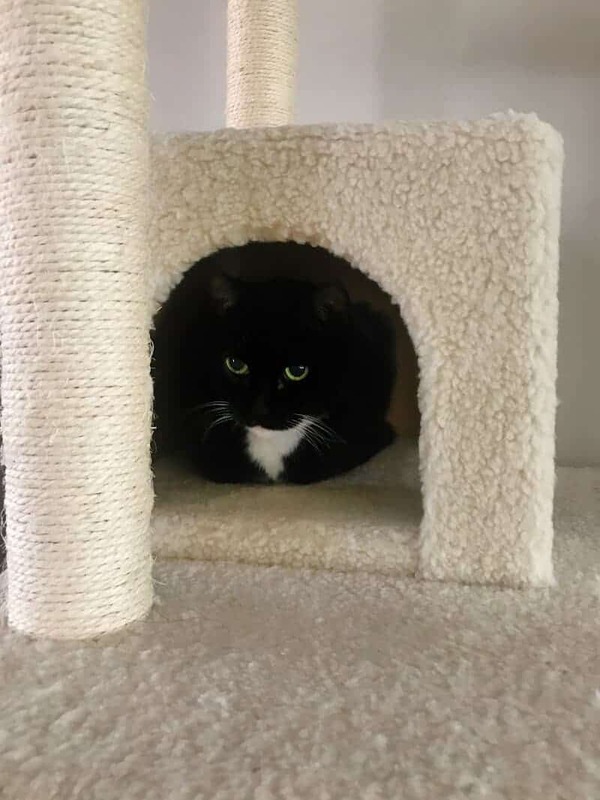 Angel has even been spotted napping in our cat tree that previously only Xena would hang out on! 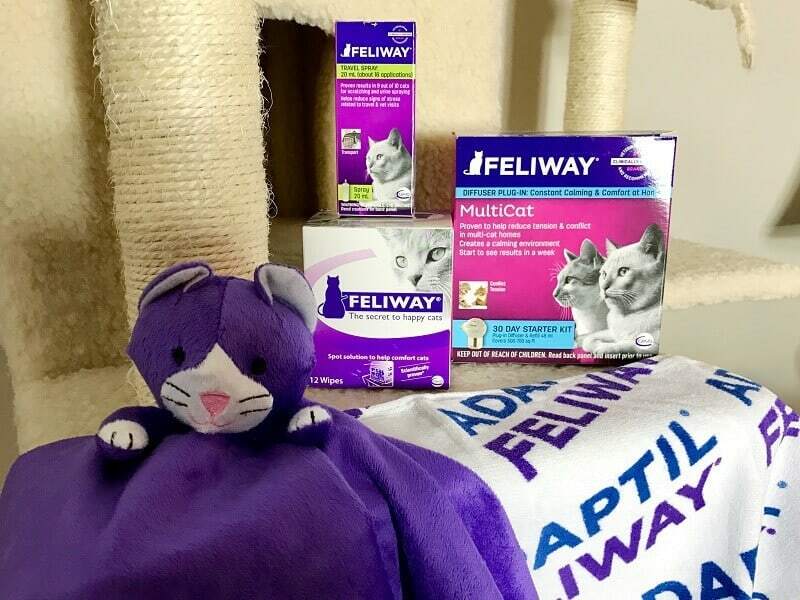 We are looking forward to seeing additional progress as we continue to use our Feliway® MultiCat Diffuser. 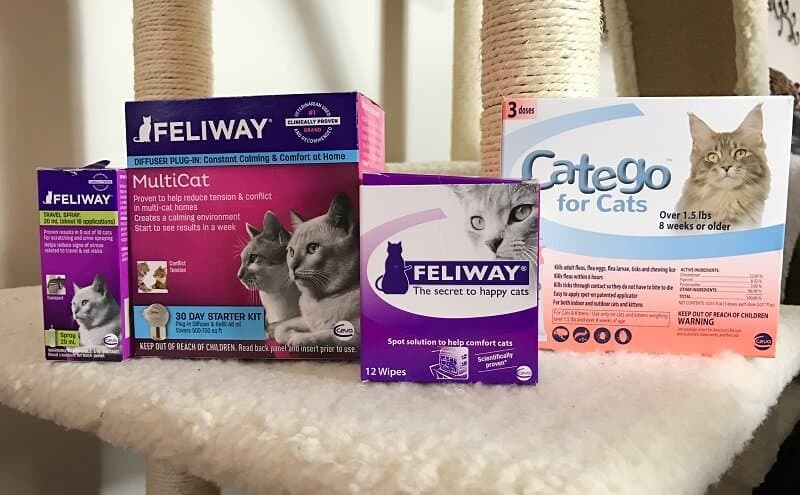 Not only does Feliway® help reduce tension between cats, but their products can also help with stress-related behaviors brought on by moving to a new home, rearranging furniture, travel, transportation, hospitalization, and vet visits. Feliway® is available through your veterinarian in a spray, home diffuser, and wipes for situations in and outside home. 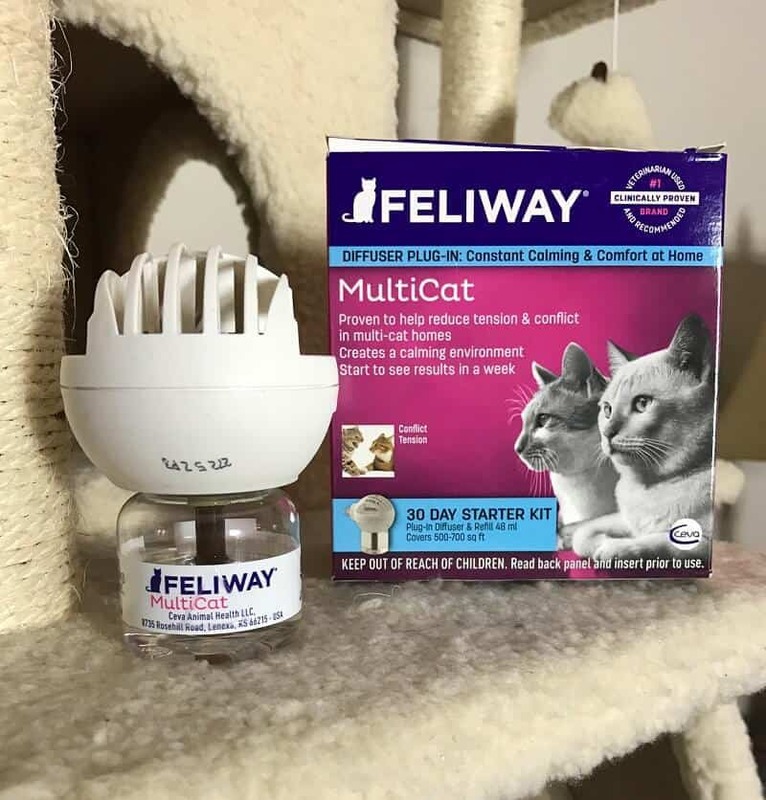 Feliway® MultiCat is available in a home diffuser. Click here to find a vet near you that carries Feliway®. Even though our cats are indoor cats, this doesn't make them exempt for the risk of parasite such as fleas, ticks, and lice. 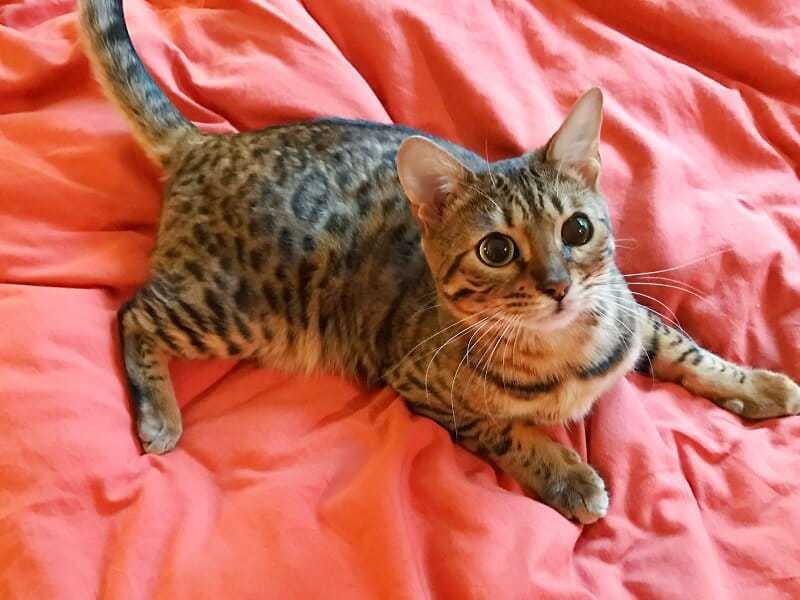 Although Angel is terrified of going outside and wouldn't dare run out the door, little Xena has no fear and is known for darting out the door at any chance she gets. If Xena manages to get outside, I want her to be protected. Plus, it is known that parasites are persistent and can find their way into our homes and onto our indoor pets. Catego™, a powerful topical flea and tick control designed specifically for cats, makes parasite prevention easy and effective. Application is only need once per month for the prevention and treatment of fleas, ticks, and chewing lice. Plus, application is easy thanks to its patented applicator. 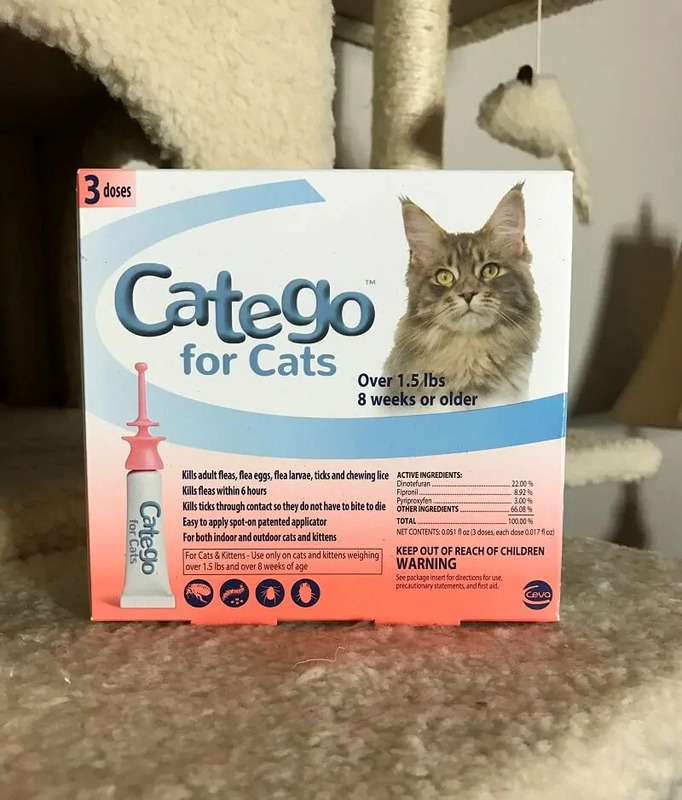 Catego™ is available on Amazon or through your veterinarian. Click here to find a vet that carries Catego™ near you. * DePorter T, Lopez A, Ollivier E. Evaluation of the efficacy of a new pheromone product versus placebo in the management of feline aggression in multi-cat households. Proc. ACVB / AVSAB Veterinary Behavior Symposium, Denver, 2014. I think I need to try the diffuser. I have 3 cats that have a conflict occasionally and the latest acquisition seems to be a target most of the time. Hopefully the diffuser will fix the problem.